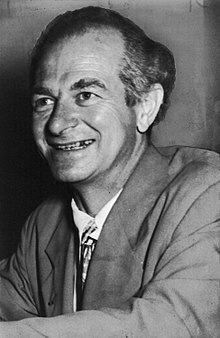 Linus Carl Pauling (February 28, 1901 – August 19, 1994) was an American scientist, peace activist, author and educator. He was one of the most important chemists in history. Pauling was one the first scientists to work in quantum chemistry, molecular biology and orthomolecular medicine. He is one of a small group of people to have been given more than one Nobel Prize. He is one of only two people to receive them in different fields (the other person was Marie Curie) and the only person in that group to have been awarded each of his prizes without having to share it with another winner. Pauling was born and grew-up in Oregon, USA. He went to Oregon Agricultural College and graduated in 1922 with a degree in chemical engineering. Pauling then went to the California Institute of Technology (Caltech), where he received his Ph. D in physical chemistry and mathematical physics in 1925. Two years later, he became an assistant professor at Caltech, and he completed his academic career there after many decades on the faculty. He was a Unitarian. In 1932, Pauling came up with the idea of electronegativity and made a scale that would help predict the chemical bonding. Pauling kept doing this work while he also did work on the structure of the atomic nucleus. In 1954, Pauling was given the Nobel Prize in Chemistry for work that he did on the structure of DNA. This work led scientists in the UK to come up with the double helix of DNA. During the Second World War, Pauling worked on military research and development. But, after the war had ended he became worried about the making and future use of atomic weapons and with the destruction forced on the world by war. Ava Helen Pauling, Linus's wife, was a pacifist and in time he came to share her beliefs. Pauling then began to talk about his worries with the effects of nuclear fallout and in 1962, was awarded the Nobel Peace Prize for his work against above ground nuclear testing. Pauling was also an author and a teacher. His first book, The Nature of the Chemical Bond (1939), is still used today. his introductory textbook, General Chemistry (1949). Later in life, he became an advocate for greatly increased consumption of vitamin C and other nutrients. He generalized his ideas to define orthomolecular medicine, which is still regarded as unorthodox by conventional medicine. He popularized his concepts, analyses, research and insights in several successful but controversial books, such as How to Live Longer and Feel Better in 1986. ↑ "Linus Pauling". 25.uua.org. Retrieved November 30, 2013. ↑ "The Linus Pauling Papers: Biographical Information". United States National Library of Medicine. Retrieved 2008-02-11. ↑ 5.0 5.1 Linus Pauling dies at 93. The Oregonian, August 20, 1994. ↑ Linus C. Pauling. Find A Grave. Retrieved December 4, 2007. This page was last changed on 19 January 2017, at 19:06.